CBDAR2011 is a satellite workshop of ICDAR2011. March, 2012 The Post-proceedings containing 13 revised full papers have been published. October 6, 2011 Slides of Keynote 1 by Dr. Qiong Liu (FXPAL) have been available. September 25, 2011 Slides of opening and discussion groups (including closing) have been available. September 25, 2011 Photos of the workshop have been available. September 22, 2011 The workshop successfully finished with 68 participants. Thank you very much for your participation! September 10, 2011 Program Booklet distributed at the workshop site has been available. September 5, 2011 Venue information has been updated. September 5, 2011 Presentation instruction have been available. August 19, 2011 Timetable and program have been available. July 6, 2011 Important Dates have been corrected. July 6, 2011 Registration fee is added. July 6, 2011 Call for Demo is added. July 2, 2011 Important Dates have been corrected. June 29, 2011 Important Dates have been updated. June 9, 2011 The submission site is open. June 9, 2011 Important Dates have been updated. March 1, 2011 Important Dates have been updated. December 31, 2010 The website is temporarily open. The authors have to submit abstracts by June 15 and full version of the papers by July 3. No new paper can be submitted after June 15. Pervasive use of camera phones and hand-held digital still and video cameras have let us discover that image-based recording of information by just pressing a button is really convenient. In addition to imaging faces and scenes, people have started capturing documents to preserve contents. Cameras, which are now functioning as personal copiers, will soon produce a huge number of imaged documents that are beyond manual handling. Although traditional techniques developed in the field of document analysis and recognition provide us with a good starting point, they cannot be directly used on camera captured images. This leads us to a new sub-field of research. CBDAR is the international workshop with a special focus on camera captured documents. 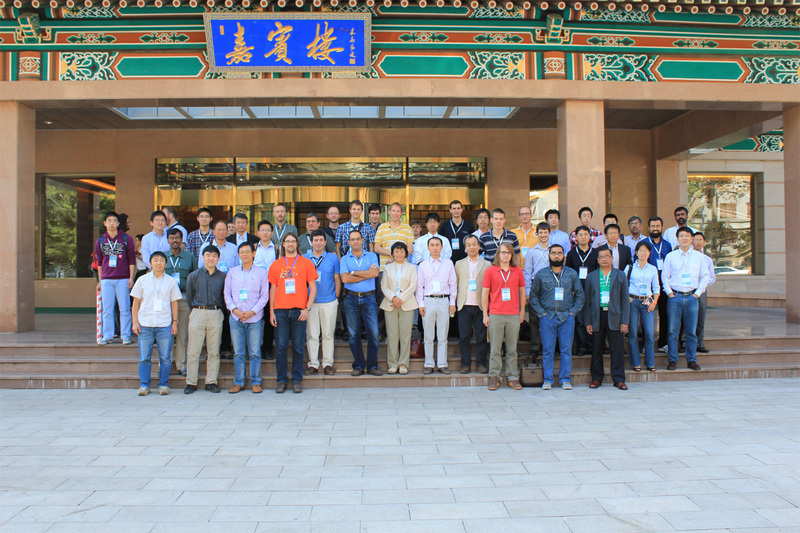 Presentation of up-to-date issues and techniques as well as discussions on future directions will boost research in this relatively new area. Participants will share experiences and problems in the area. Qiong Liu is currently a senior research scientist at FX (Fuji-Xerox) Palo Alto Laboratory. He received his Ph.D. degree under Professor Thomas Huang and Professor Stephen Levinson from UIUC in 2001. He is the author and co-author of over 50 papers and holds over 40 issued and pending patents in the fields of PaperUI, object/document recognition, IR-camera based vital sign detection, immersive conferencing, signal processing, human-computer interaction, and robotics. Abstract: PaperUI is a human-computer interface concept that treats paper as displays that users can interact with via mobile devices such as mobile phones and projectors. It combines the merits of paper and the mobile devices. Compared with traditional laptops and tablet PCs, devices involved in this concept are more light-weight, compact, energy efficient, and widely adopted. Therefore, we believe this interface vision can make computation more convenient to access for general public. With our implemented prototype, pilot users can read documents easily and comfortably on paper, and access many digital functions related to the document via a camera phone or a mobile projector. Alessandro Bissacco is a software engineer at Google since January 2007. He has worked on projects involving image matching, landmark recognition, object detection, text detection and OCR. His contributions are in use in several Google services such as Streetview, Google Goggles and Image Search. Currently he leads Google efforts on developing new technology for reading text from camera images in unconstrained environments, such as Google Goggles and Streetview. He holds a PhD in Computer Science from University of California, Los Angeles. This will be a 100% participation, one-day, single-track workshop featuring keynote talks, oral/poster presentations, a demo session, and a discussion group. Papers should not exceed 6 printed pages in IEEE-CS format available below, which is the same format as the main conference. This workshop employs single-blind review, in which referees remain anonymous for the authors throughout the process. Click here to go to the submission site. Electronic as well as printed copies of the workshop proceedings containing all contributed papers will be distributed at the workshop. After the workshop, revised versions of selected papers will be published in Springer LNCS series as post-proceedings. We would like to invite you to participate in a demonstration session at CBDAR 2011. If you would like to participate it, we will provide a table and standard power. Please provide us (cbdar2011-inquiry __[[at]]__ ml.osakafu-u.ac.jp) with the title of your demo, your name and affiliation by August 15th. 2) Provide a one page abstract of your proposed demo together with your request. The abstract, which will appear on the workshop website, should contain a title, the presenters names and your affiliation. Each oral presentation has 20 or 15 min. including QA. Please check the length of your presentation and consider to finish your presentation 3-5 min. advance in order to accept questions. The same poster boards are used as ICDAR. Guidelines can be found at http://www.icdar2011.org/EN/column/column32.shtml. A table and standard power in addition to a poster board for each demo presentation are available. If you need special requirements for your demo presentation, please let us know. 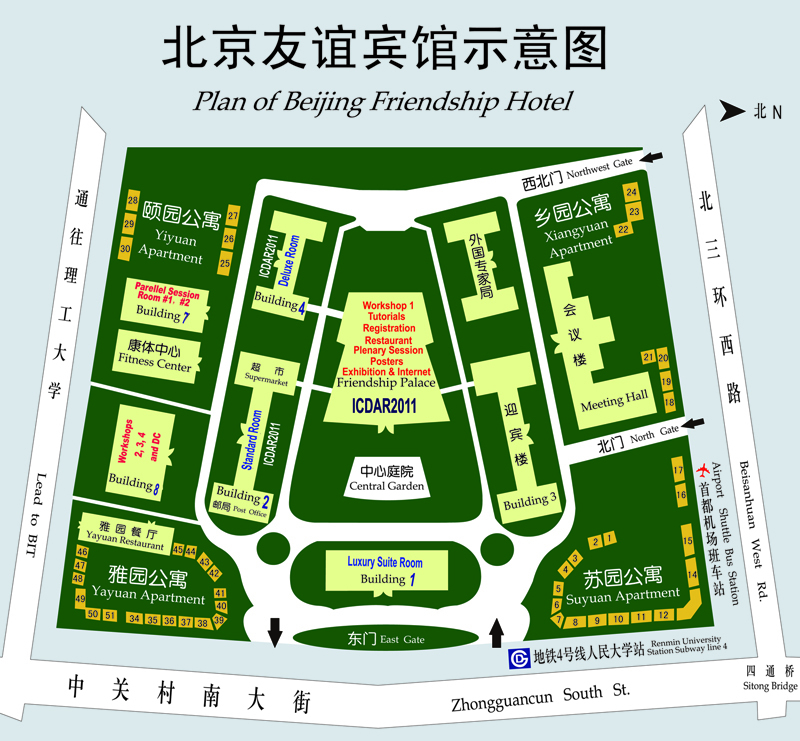 The workshop will be held in Beijing Friendship Hotel which is the same venue as ICDAR2011. 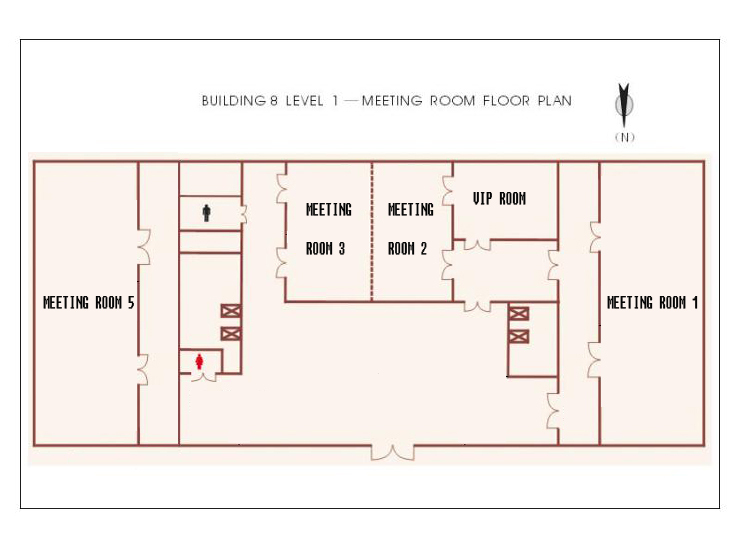 The main site is Room #2 of Bld. 8. Poster and Demo Sessions will be held in the neighboring VIP room.